Woodbine, Md. 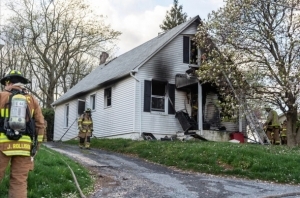 (DG) – A fire in Carroll County kills a dog and sends a woman to the hospital. Firefighters responded Monday around 6 p.m. to the 7000 block of Woodbine Road for a two-story home on fire. Patricia Porter, who lives in the home, discovered the fire in the living room. She was able to rescue one dog, but another dog perished in the blaze. Porter received smoke inhalation and was taken to Bayview Medical Center. Forty firefighters had the flames under control within 30-minutes. Damage is estimated at $75,000. The cause of the fire remains under investigation.